As you might expect, there are quite a few duck recipes on our website. From the meaty breast of the mighty moulard duck to a tender leg of duck confit, we love it all. If you are stuck on duck like us, have a gander at this selection of recipes. And enjoy this video of Sara Moulton and Ariane demonstrating how super easy it is to sear a duck breast for dinner. Duck breast is the new steak, after all. This simple and refreshing duck salad makes a cooling first course or light lunch. 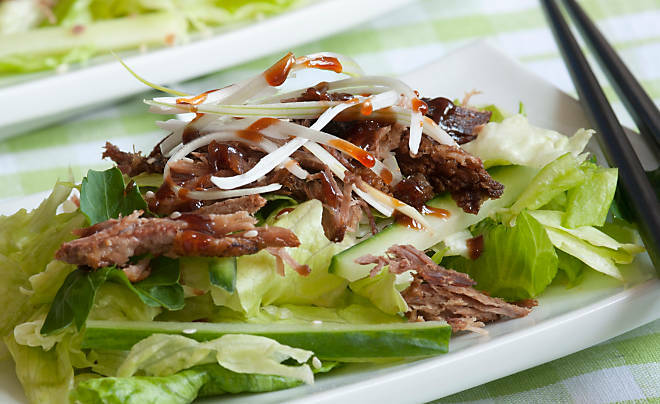 The tangy lime vinaigrette is tempered by rich duck and a drizzle of sweet, Thai-style sauce. 1. Make the sauce: Combine ingredients in small sauce pan over medium high heat. Bring to a boil, stirring occasionally. Reduce heat to medium-low and simmer until sauce reaches a syrupy consistency, stirring occasionally, about 15 minutes. Cool completely. 2. Broil the duck legs until skin is browned and crispy, and meat is heated through. Carefully remove from the bones and shred. 3. In a large bowl, whisk together dressing ingredients. Add lettuces, mung beans, cucumber and herbs. Toss to coat. Divide salad between two plates. Top with shredded duck. Drizzle a little of the reserved sauce over the duck. Garnish with sesame seeds. The green Picholine olives in Chef Daniel Boulud’s braised duck provide juicy bites of tart, salty flavor. 1.The night before you plan to serve the dish, place a rack in the lower third of the oven. Preheat oven to 350 degrees F.
2. Season the duck with salt and pepper. Heat the olive oil in a medium cast-iron pot or Dutch oven over medium-high heat. Add the duck legs and sear until golden brown on all sides, 7 to 10 minutes. 3. Transfer the duck to a platter. Pour off the excess fat from the pot. Return the duck to the pot along with the bacon and cook, stirring, over medium-high heat for 5 to 6 minutes. Spoon out any fat out of the pot. Add the carrots, onions, turnips, olives, thyme, and bay leaf, and pour in the stock. Transfer the pot to the oven and braise, covered, for 2 hours, until the duck is tender. Chill overnight. 4. Preheat oven to 350 degrees F. Remove the layer of fat from the top of the sauce and heat the duck in the oven for 30 minutes. Remove the thyme sprigs and the bay leaf and serve. Heady Chinese five spice and a sticky-sweet sauce spiked with star anise make a wonderful complement to rich duck breast. 1. With a sharp paring knife, score the fat of each duck breast in a cross-hatch pattern, making sure not to cut into the meat. In a small bowl, mix together five spice, salt and pepper. Rub the duck breasts with the spice mixture. Heat a heavy frying pan over high flame. When hot, add the duck breasts skin-side down. Turn the heat down to medium and and cook for 5-6 minutes or until the skin is very crisp and brown and the fat has rendered from under the skin. Tip out any excess fat. Turn the breasts over and add the star anise to the pan. Cook for another 5 minutes or until the duck breasts feel firm to the touch but not too solid – you want them pink in the middle. Take the duck out and leave to rest for 5 minutes. 2. To the same pan, over medium high heat, add the demi-glace, soy sauce, and honey, stirring to combine and, scraping up any browned bits from the bottom of the pan. Cook, stirring occasionally, until the sauce starts to thicken. Add the bok choy and scallions. Cook, turning to coat, until the bok choy is cooked through but not soggy. 3. 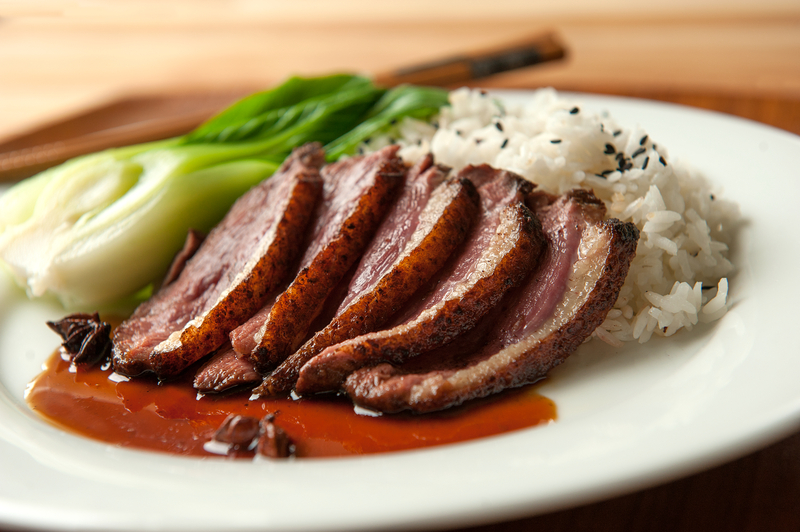 Serve duck breasts over rice with steamed bok choy. Spoon sauce over the top. This recipe, from the excellent Blue Ribbon Cookbook, is the Bromberg Brother’s twist on a classic club sandwich using flavorful duck instead of turkey. We consider it lunch heaven in the palms of your hands. 2. Using a sharp knife, score the fat of the duck breasts in a cross-hatch pattern, being careful not to cut the meat. Season generously. Heat a large skillet over medium-high heat until very hot. Sear the duck breasts, skin side down, until the skin browns and the fat renders, about 8 minutes. Place the duck, skin side up, on a rimmed baking sheet. Roast until an instant read thermometer inserted into the thickest part of the breast registers 140 degrees F, about 15 minutes. Remove from the oven and allow to rest and cool. Once cooled, slice very thin against the grain. 3.To assemble the sandwich, spread 1 tablespoon mayonnaise on each of 4 slices of toast and sprinkle with half of the bacon. Divide the lettuce evenly among the breast slices then top each with half of the sliced duck. Top with second layer of toast and spread the remaining mayonnaise over the slices. Sprinkle with the remaining bacon. Top with tomato, onion, and the remaining duck. Cover the sandwiches with the remaining slices of toast, cut into quarters and serve with your favorite potato chips. Visit our website for more recipes like these, and please share your home-cooked duck dishes on our Facebook or Twitter pages with the #duckspotting. We love to see what’s happening in the kitchen.